The key to successful fall protection design lies in identifying the criteria affecting the roof and the way workers will interact with it when performing their duties. Whilst every effort should be made to completely eliminate risk by locating plant and equipment in safe locations, it is inevitable that guttering, skylights, chimneys and other equipment will at some point require maintenance where a fall risk is evident. Remember under legislation the designer is legally responsible for ensuring that adequate provision is made for protecting workers working at height throughout the building’s life. The highest priority is to consider ‘collective’ measures such as guardrails but, in practice, this approach is generally limited to flat roofed areas and there may also be architectural, technical, cost and a host of other reasons why collective solutions are not suitable. 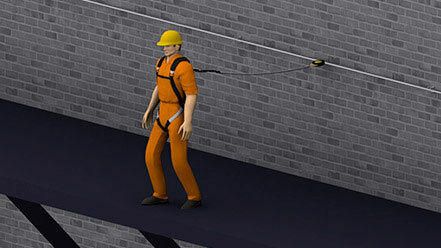 In these situations, Cable Restraint or Fall Arrest Systems, offer the most practical solution. Crucially, Barton’s systems provide an easy, efficient and thoroughly dependable method of complying with all safety at height regulatory requirements. Identify the areas of the roof which require access for cleaning, maintenance or inspection. Pay particular attention to the location of the gutters because they represent the most common reason for workers accessing a roof. Identify safe entry and exit points to and from the system. For example through a roof hatch, or by an external ladder. 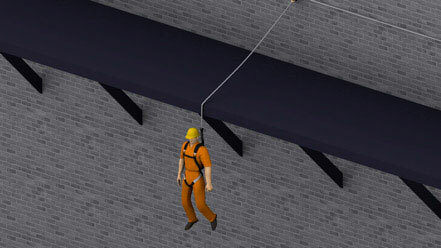 A worker should be able to connect to the system before getting on to the roof and remain attached to it while getting off the roof. Once on the roof, a worker should be able to move from one part of the system to another without ever having to disconnect from the system. The planned route of your system should avoid workers having to step on to or cross roof lights or glazing even if such assemblies are designed as 'tread safe'. The ground clearance must be taken into consideration. Make sure that the system is situated more than 2 meters from the nearest hazard. Identify the type and profile of the roof panel to which the system will be fixed. Ensure that the panel complies with the recommended standards for foot traffic. The system is designed for up to a maximum of 3 simultaneous users, If 4 or more persons must use the system simultaneously, energy absorbers must be included in the design of the system, in order to limit loads to 10 kN in the event of a fall. This type of system will prevent the worker from reaching any point where a fall can occur but allows full access to carry out work activities. The Personal Protective Equipment (PPE) used are critical parts of the system design and operation. The use of the incorrect PPE may cause the worker to be unprotected. Hence, Latchways recommends that all anchorages and components are designed to fall arrest standards. Therefore if the system is misused, for example the wrong PPE is worn, the system will still protect the worker. Here a worker may be allowed to reach the point where a fall can occur. This type of system will protect the worker from serious injury as it minimises the effect of any fall. The height of the worker. Without this clearance, the worker may strike the ground or obstacle before a fall is arrested. With ankle height systems a short lanyard should be used wherever possible, while allowing the user free movement. Such systems have a higher free fall distance. Where there is insufficient fall clearance, a 'guard the hazard' approach must be adopted. Workers find perimeter systems easier to use as the distance between them and the system is usually shorter. The systems can be used after basic training. Such systems are better for wider roofs. The system should be no less than 2 meter from the edge of the roof. Assuming that a worker will attach to the system using a standard 2 meter lanyard, the 2 meters guide distance will protect the worker. It will allow sufficient access for roof edge tasks. Perimeter systems do not give blanket coverage of a roof. If blanket coverage is required and a ridge system is deemed impractical, then a series of interconnected systems must be installed across the whole width of the roof. Ridge systems expose workers to pendulum swing hazard when accessing the corners of the roof. Ridge systems should not run to the end of the building. Ideally, they should stop 1/3 of the edge distance from the building end. Where corner access is required it is necessary to include anti-pendulum posts. These posts should be installed in each corner of the roof at approximately 1/3 of the system's edge distance from both sides of the corner. Workers on ridge systems will frequently have to adjust the lanyard length and carry two lanyards. The second one will be used on anti-pendulum posts. In this case a considerable degree of worker competency is required. Specialist training on the use of adjustable PPE is required prior to use. There is an increased risk that the worker may slip, especially in wet conditions. The workers tend to pull themselves up or lower themselves down the system which could cause the energy absorbers to deploy. The task of minimising the risk is best achieved by a perimeter system, while recognising that it is not always possible. A ridge system can provide acceptable safe access as long as the worker is competent to use the system and the PPE required.